Many individuals who carry out shifts have sleep difficulties associated with the change in pattern of sleep. These problems usually become worse as people get older and with an aging workforce this becomes a significant difficulty both for the worker and for management. There are techniques to minimize the problems of shift-work and recently there have been some exciting developments which suggest that one can almost eliminate the problems of switching your body clock by 12 hours every week or two. 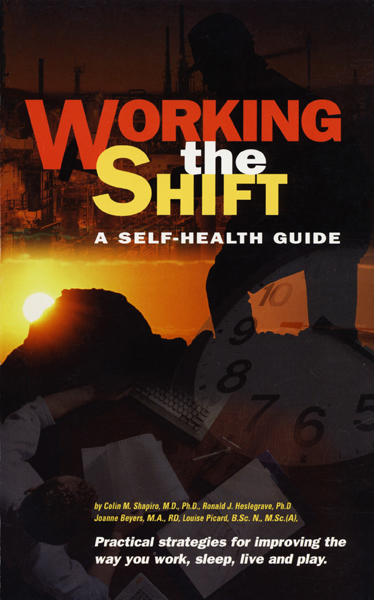 There are many sources of good advice for shift-workers and one of these is a book that was written by members of our clinic entitled "Working the Shift"
In some extreme situations a recommendation not to work shifts may be given and or there may be other interventions that would be helpful. The rates of many medical problems are high in shift-work and this applies particularly to heart disease, gastrointestinal disease and depression related problems. It is often extremely helpful to treat the depression if this is a component of the problem. This allows the shift-worker to cope better with their shift-work. This can lead to a return to managing to do the shift-work. The treatment for depression may be a psychological treatment or a pharmacological treatment or often a combination of the two.